Scanlan Glass is located in Red Hook, Brooklyn. Kevin is originally from Detroit, Michigan where he attended the Society of Arts and Crafts (now known as The Center for Creative Studies). His glass styles range from functional to abstract and conceptual. His work has been seen and sold around the world in such places as The Museum of Modern Art store in NYC, American Craft Museum store in NYC, Habitat and Ariana Galleries in the Detroit area, the Corning Museum of Glass as well as many more around the world. Kevin also teaches off-hand glassblowing in his Brooklyn studio. 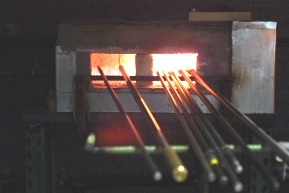 Click here to learn more about GLASSBLOWING CLASSES. Kevin is one of the featured artists in Richard Yelle’s books: GLASS ART FROM URBAN GLASS and his most recent book INTERNATIONAL GLASS ART released September 2003.